Printing a church directory in ChurchSuite is simple, easy and quick. Go to "Address Book" > "Communication". You can either select "All Contacts" if you want your entire Address Book to be included in the church directory, or you could select "By Tag" if you have a specific tag, such as a Members tag or Directory tag, that you'd like to use. Scroll down to the shaded box at the bottom of the page that says "PDF" and click on "Options". There, you have a number of choices, such as whether to include photos, children, addresses, etc. If you want to print it as a "booklet", make sure "Output collated format" is ticked. When you've made your selection, click "Generate PDF". 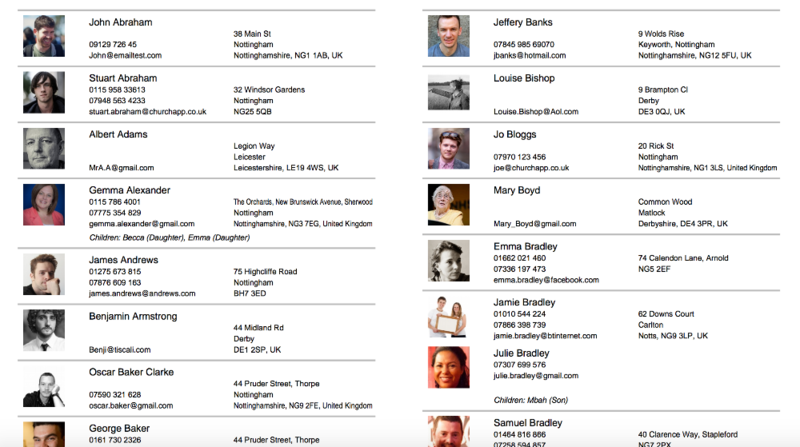 Ordinarily, ChurchSuite respects the public communication settings of your Address Book contacts. If a church member sets any of their details to not be visible to other church members (e.g. which affects what church members can see in My ChurchSuite > Search for Others), those contact's details are also not shown in the printed church directory. It is possible, however, to override this - by deselecting "Respect contact Public Communication settings" - this will cause your PDF to include full contact details of all contacts selected, irrespective of the public communication settings those contacts may have defined. Clearly churches must be considerate of confidentiality and respect each contact's privacy when sharing information. However, subject to your church's data protection policy, where a printed directory is only being produced to only be used internally, perhaps by the staff team only, then this may be deemed appropriate. By default, ChurchSuite respects each contact's personal public communication settings. It must be deselected (unticked), to be overridden. You should now have an elegant-looking PDF file of your church directory, ready to print!